ECB says “no more” to the Greek banks. The ECB has announced its reaction to the Greek referendum decision and the interwebs are a bit confused. The headline “ELA to Greek banks maintained at its current level” may seem like good news for Greece in that the ECB has not completely cut off the emergency credit line for the Greek banks. In practice, however, the implications for the next few days are pretty much the same as if the ECB had ordered the ELA programme to be cancelled altogether. 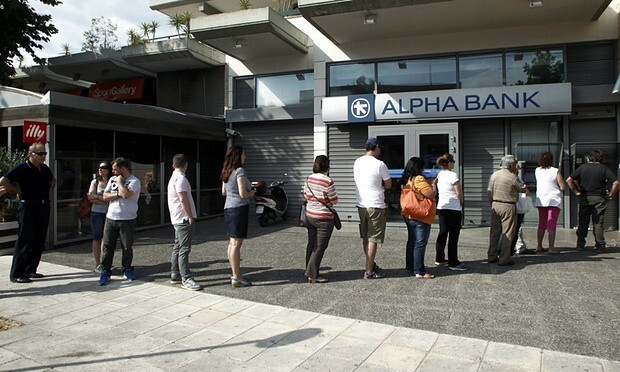 We don’t know how much of buffer in cash and reserves the Greek banks had on Friday. However, the ELA ceiling has continually been raised at ECB Governing Council meetings over the past few months, suggesting the banks have continually been close to running out of cash. That means its unlikely they have much left in cash or reserves at the central bank. In that case, the only way the Greek banks could finance the (presumably very large) demands for withdrawals on Monday would have been to get access to additional funds from the Bank of Greece in the form of additional ELA. That will not be possible now, so most likely the banks will not open on Monday. The statement that “ECB will work closely with Bank of Greece to maintain financial stability” is probably code for “ECB will help Greece to design a programme of capital controls”. So it has come to this. No matter how well things go from here (and positive scenarios are hard to imagine) restrictions on Greek banks could be in place for a very long time. It is easy at this point to panic and say it’s the end of the world and a new currency must be days away. It’s worth remembering, however, that Cyprus coped surprisingly well with the capital controls imposed in 2013. These controls were lifted this year and the banking system survived. There is probably still a small window of opportunity left to keep Greece in the euro, even if the banks don’t open tomorrow.